Want To Enter An Asylum? ﻿ There is no right time to wander it’s halls. For the energy is drenched throughout at any given time. May they and I say they simply because there is many, either being residual or intelligent in nature, they do often make their presence known. I’m referring to the maze known now as Rolling Hills Asylum located in East Bethany, NY. A location I had the privilege in visiting last spring for a brief investigation. Let me say I was lucky too, I had made plans several times to make my way down there to investigate RHA either with other paranormal outfits or with my investigative team, Southern Ontario Paranormal Society, things never materialized until finally making my way down there when I did. Not much soon after I had visited RHA, the owner at the time had made the painful decision of putting the asylum up for sale. Now, many of us realize, a massive chuck of real estate such as RHA is in a market puttering along in a recession state would almost be impossible to sell. What a devastating blow this was going to be, especially for all those people who spend tons of hours in this location research and documenting not only it’s paranormal activities, but the location’s history as well. People like my good friend Marlena Treat who knows RHA like the back of her hand, this was a really tough thing to accept. Sadly for me, the thought was simple, that last spring was going to be the one and only time I was able to really experience the many energies RHA had to offer. I say many simply because, though only spending minimal time there in an investigative mode, there were many aspects that really made me truly believe it was a location I would need several visits to to try and begin to understand. There was at one point during my visit, that I broke off from the small group in which I was doing some work with (Robbie Thomas and Rob Stone) and walked off to wander an area where no one was at the time. I really wanted to soak in the quietness, to really experience the energy the location had to offer. It was at that point, I realized that not only was there residual energies there, but intelligent ones as well. And it was the ladder energies that you really felt for when the news broke out that RHA was going to be for sale. The thought that maybe it might take years before anyone would purchase the location and even so, ran the risk that the new owners wouldn’t have the best interests of the location in hand. Or the saddest thought, the terrible image of Rolling Hills Asylum, years of important history meet the likes of the wrecking ball. For almost 6 months the asylum sat without ownership, then as if God or the Gods above heard the warrior cries from the Rolling Hills spirits, a spark of positive news sat under the radar for awhile. Someone had serious took interest in purchasing Rolling Hills, once called The Genesee County Poor House wasn’t going to be poor anymore. Then 2010 brought the official news that someone had purchased Rolling Hills, that someone being Sharon and Jerry Coyle. The most intriguing part of that was that I had met Sharon along with Marlena back last spring during my visit to RHA. So, this news was even more special as given the fact that I had maintained a friendship with both on certain levels. So, the though that RHA now had a second wind brought instant exhilaration to the prospect of being able to make my way back down there to further investigate the energies that RHA offered. Still, there is one aspect that really needs to be pointed out amidst all this wonderful news. 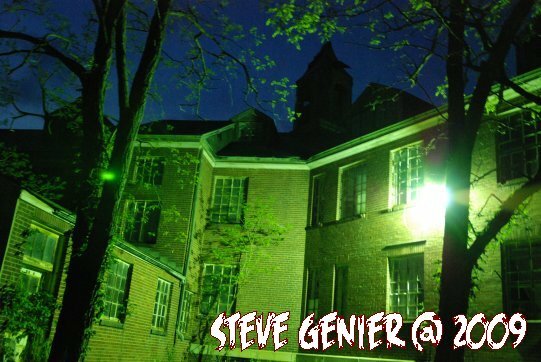 Rolling Hills Asylum is a huge undertaking for Sharon and Jerry. We as apart of the paranormal community must not only thank them for given this very historic site a second chance, but we must also ban together to help support them in maintaining a healthy future for one of the most active locations out there for those who seek the paranormal. I truly believe that RHA is now in great hands, not to say the last owners weren’t, but now that I know the face behind it, things are truly more personal now. Something I have assured Sharon of, that if there is ever anything I can do to help, she knows I will certainly do my best to do so. Something I urge you all out there to do as well. If it not for Rolling Hills Asylum, may it be for another paranormal or historical location in your area. In the meantime, if you plan to take your paranormal investigative group somewhere on a road trip, I would highly recommend RHA out of first hand experience. You certainly won’t be disappointed at all. For full details on how you can arrange for an investigation or visit to the Rolling Hills Asylum, you can find it all HERE! No, I’m not a sales pitcher for them, though I would have problems promoting the hell out of RHA to show support, I’m just someone who cares about second chances, especially when it’s in good hands!